We had two pleasant days of motoring and sometimes motorsailing on the ocean, arriving in Miami yesterday. The wind was never in a favorable direction to sail. 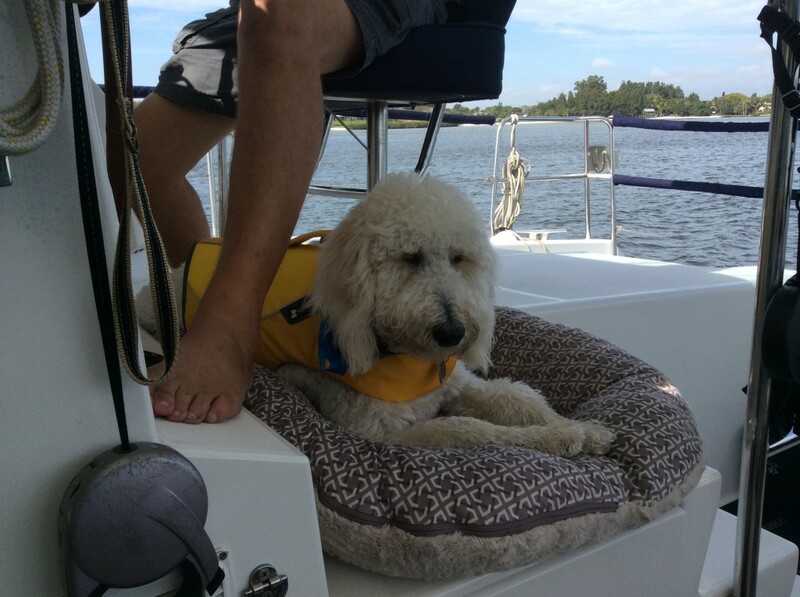 The first day we stopped in Ft. Lauderdale and anchored in Lake Sylvia. It was an uneventful day until we entered the inlet, Port Everglades. Since the ocean was calm, we hadn’t put away many things. A catamaran is usually level enough that we rarely worry about something falling. However, we hadn’t counted on a large motoryacht speeding past us in the inlet. Not only didn’t they slow down, they came very close to us. The wake the yacht created violently rocked us causing numerous items to fall on the floor and our tomato and strawberry plants almost went overboard. We always get some wake from boats that insist on racing in and out of the inlets and expect it, but this one was extreme. We have never rocked this much even in very rough seas. The rudeness of the pontoon boat driver the previous day on the ICW was almost excusable and could be chalked up to ignorance, but anyone piloting a million dollar plus yacht should know boating etiquette and rules. Very obviously the captain didn’t care. Sadly, in both Ft. Lauderdale and Miami encountering rude boaters is more common than not. After we went under the 17th Street Causeway Bridge into the New River, we let Sailor out on the deck. He loved watching all of the sights and the wind blowing in his face. 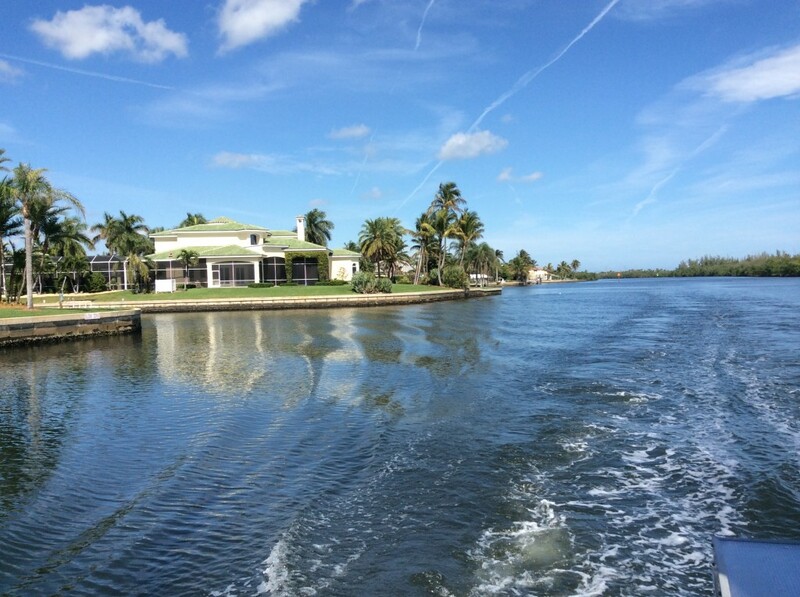 Once we dropped the anchor in Lake Sylvia, one of only two anchorages in Ft. Lauderdale, we settled into a quiet afternoon…..until the waterskiers arrived. For some odd reason they are allowed in this very small “lake” and to my knowledge not anywhere else in the city. Of course this causes all anchored boats to rock. These three teenagers were terrible skiers and never went more than a few feet without falling, so they stopped and started many, many times. However, after our recent experience with the motor yacht, we hardly noticed their wake. 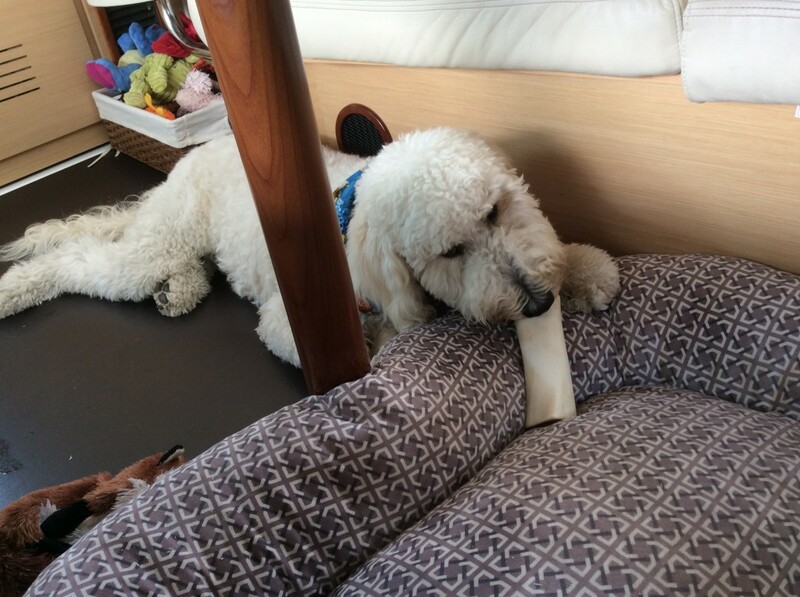 now that he has a few days of cruising experience, Sailor has settled into his favorite spots to ride out the waves. He seems to prefer the salon, but only if one of us is there with him. Day 3, from Ft. Lauderdale to Miami was a little less smooth and when we got onto Biscayne Bay it was quite rough. We had 24 kt winds the whole day, but they were from the south, so we were going right into them and couldn’t sail. Sailor seemed ready to stop. While we were getting the mooring ball attached in Dinner Key, we kept him inside the salon. When I came back to let him out, I saw him on the salon couch watching us out of the window. 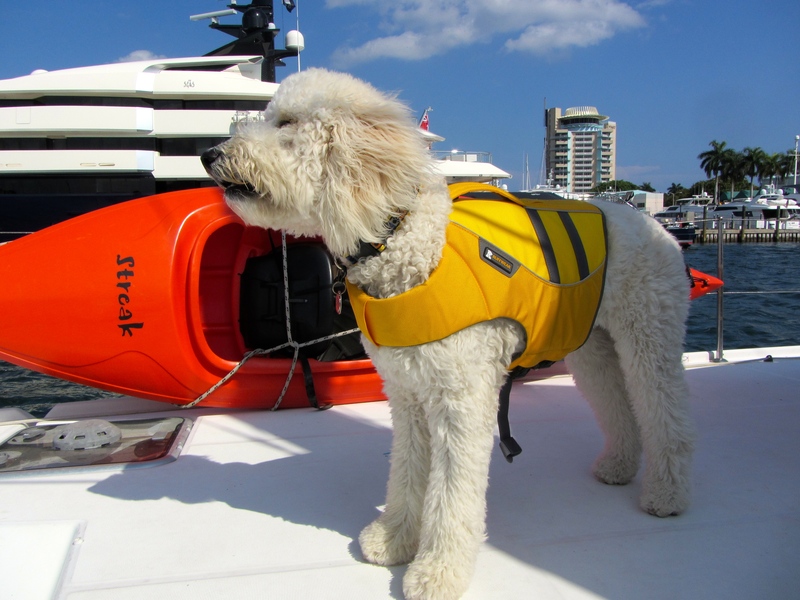 This puppy gets bolder and bolder every day but we are very pleased with his skills as a boat dog. After a bit of tentativeness getting in and out of the dinghy, he now goes down the steep sugar scoop steps and hops into the dinghy with ease. He has his sea legs at high speeds in the dinghy as we crash through waves. We are using the word “OK” to let him know when to get out of the dinghy and he has learned to wait. However, even after only a few dinghy rides, he assumes he gets to go all the time and if one of us goes in the dinghy and he doesn’t get to go, the whimpering begins. 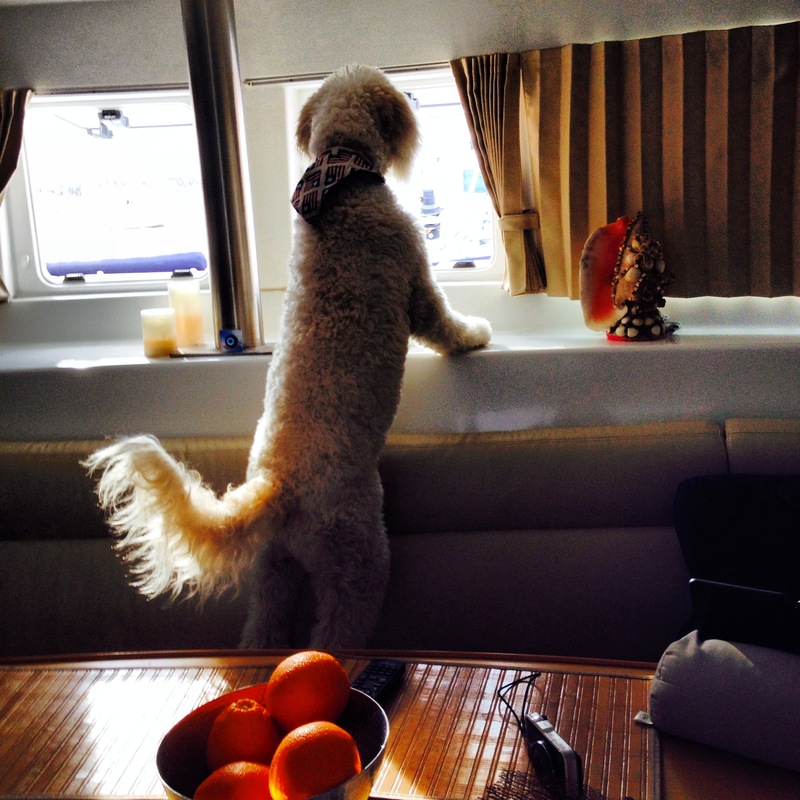 So far we haven’t left him alone on the boat. Now for the bad news. The watermaker wasn’t working when we left Stuart, but Mark thought he just needed to clean a thru-hull. He did that in Lake Sylvia, turned the watermaker on and it made a loud noise. After trying numerous possible fixes, he called a Spectra Watermaker service rep who first thought there was air in the raw water feed. We went on to Miami and after more diagnosis, we found out the watermaker will need a new pump. We are trying to get it delivered overnight from California. In the meantime, the weather conditions are no longer favorable for crossing to the Bahamas and our next good window is Tuesday. As the saying goes, “Everything on a boat is broken…….you just don’t know it yet. We’ll make the best of our time here. 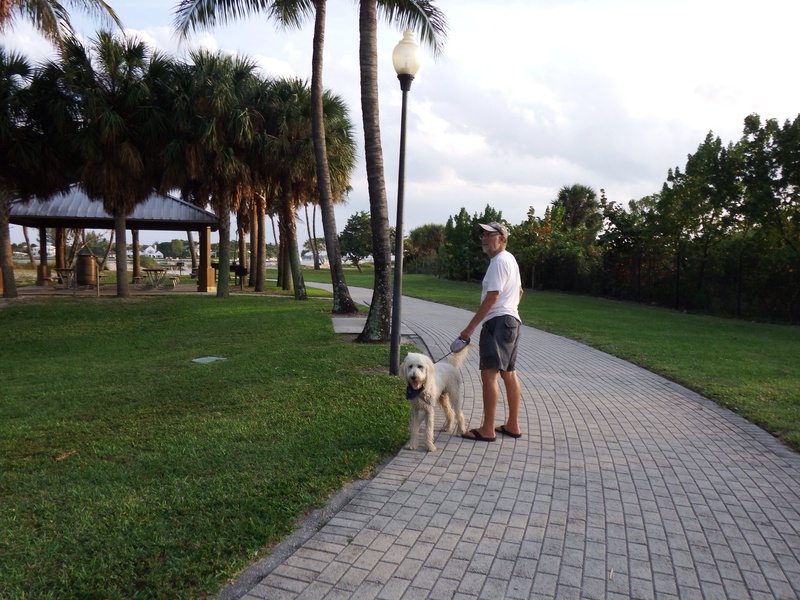 There is a fantastic dog park within walking distance. 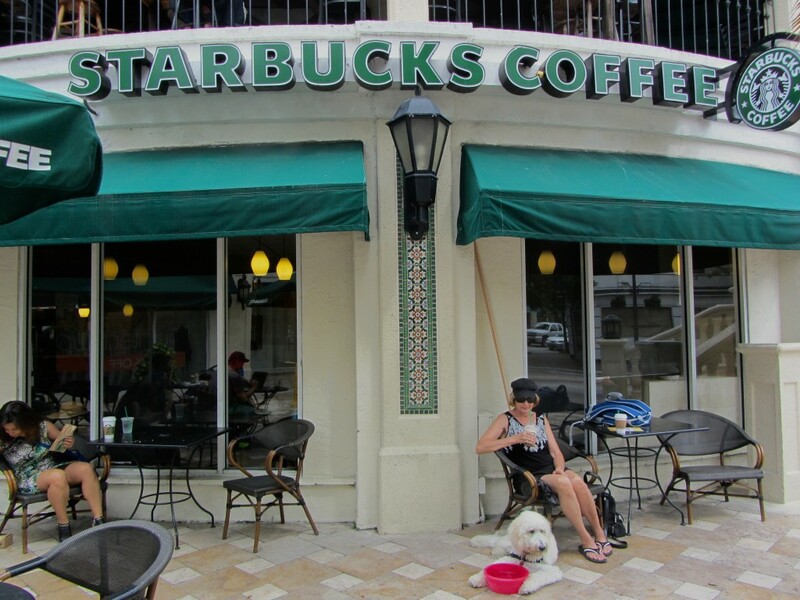 Coconut Grove is very upscale, thus there is a Starbucks, many good restaurants and lots of boutique type shops. Within walking distance there are grocery stores, a West Marine and probably one of the best hardware stores we’ve very seen, Shell Lumber and Hardware. Hopefully we’ll only have a few more days to enjoy the area. This entry was posted in Sailing on February 28, 2014 by Jan.
We finally left the dock at Sunset Bay yesterday. On Sunday we drove to Ft. Lauderdale to pick up a new (used) chart plotter. Mark spent the rest of Sunday getting all the electronics working and the chart plotter installed. Monday morning we were ready to go. The ideal time to leave would have been in the early afternoon when the tide was coming in and we would be pushed away from the dock. Knowing I was nervous about the current forcing us too close to the other boats on the dock as we left, 8 or 9 dockmates were there at 8 am ready to help. One friend even came aboard with a fender and boat hook. As it turned out we didn’t need a lot of help. With me holding a fender at the very back of the boat at the bottom of the sugar scoop, Mark pivoted the front off the dock and when we were almost pointing straight out, we released the final line and headed between the dock and the mooring field to the fuel dock where we left Dave off, filled our tanks, pumped out the holding tank, and called the Old Roosevelt Bridge tender to ask him to raise it. Usually this method isn’t enough, but thankfully this time it worked perfectly. 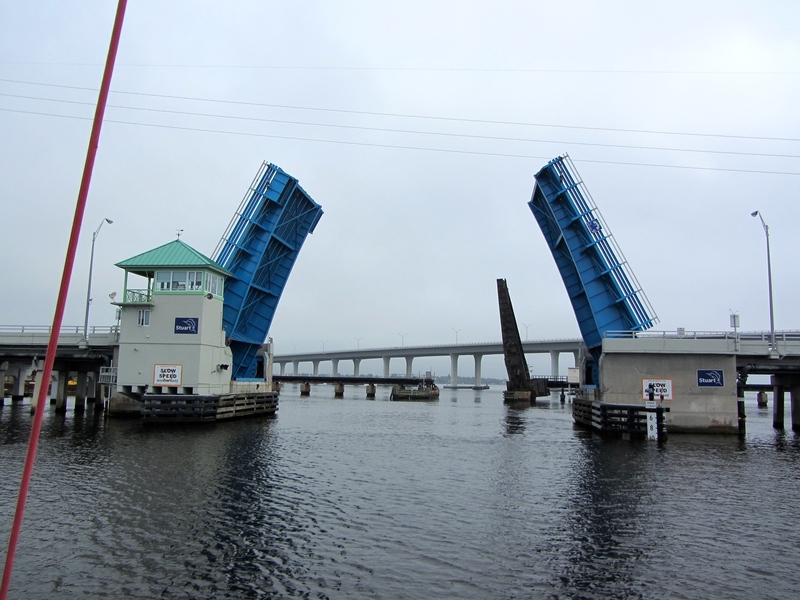 In the photo below you can see the first three bridges we had to go under starting with the Old Roosevelt bascule bridge, then the railroad bridge, then the 65 ft New Roosevelt Bridge. 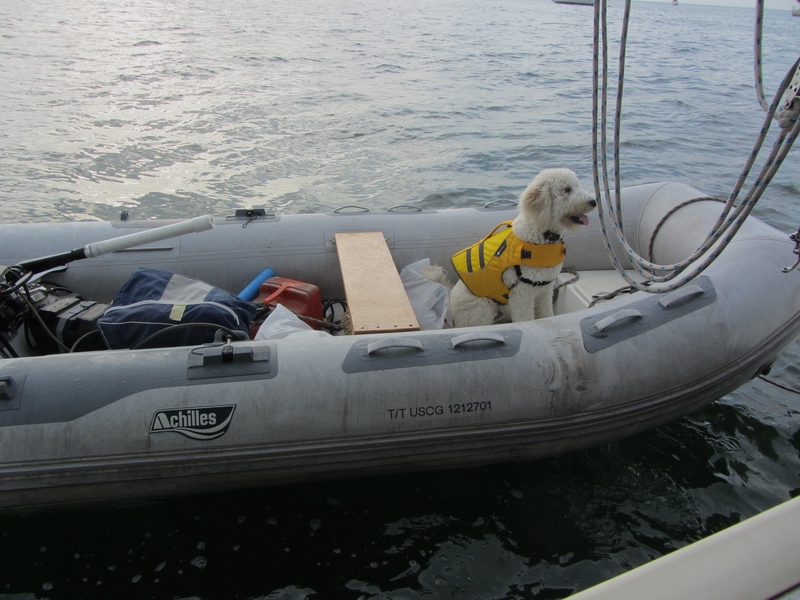 Our major concern was Sailor, since this was his maiden voyage. He settled in nicely in Daisy’s old spot under at the helm next to Mark’s feet. He stayed there most of the day until it became too hot. Then he moved into the salon under the table. I gave him a peanut butter stuffed bone that I had bought specifically to comfort him, since he can chew on it for hours. This is the only part of the trip where we are on the ICW (Intracoastal Waterway) and it is beautiful. We pass through multiple areas lined with mansions sometimes with megayachts on their docks. The ICW is usually much calmer than the ocean, however we encountered quite a few boats racing by us creating wakes that bounced us around. One incident in particular was scary to the point of being dangerous. We had to go under 12 bridges, only three being fixed 65 ft bridges. Some opened on request and others were on a fixed half hour opening schedule. After requesting an opening at one, the bridge started to raise and we pulled closer to go under it. When boats are on both sides, usually you talk on the VHF radio to arrange who is going first. The protocol is either the first one to arrive, or the one that is going against the current goes first. 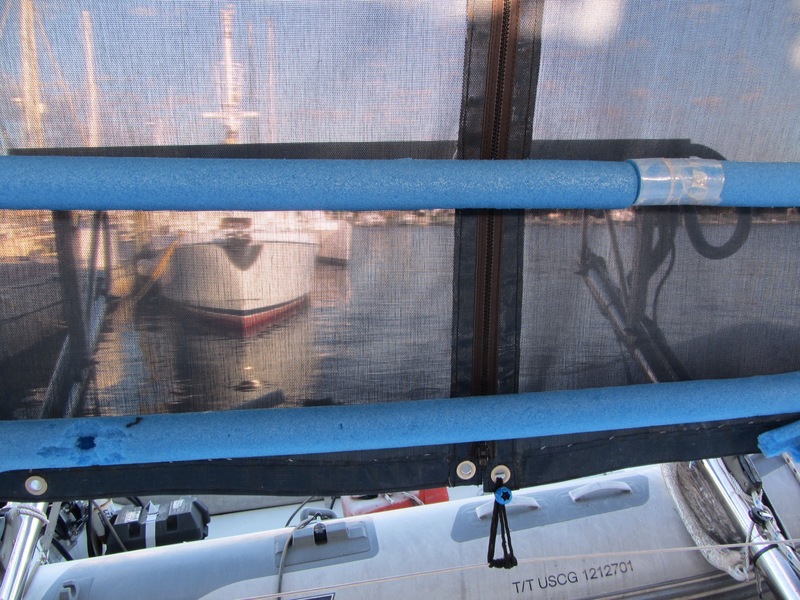 Smaller boats that don’t need the bridge raised are supposed to yield to the ones going under, especially sailboats who have to maneuver their mast away from the raised bridge. As we were going under it we had to move to the other side of the channel to avoid hitting the raised bridge. A small pontoon boat with a load of passengers sped right towards us and met us under the bridge, in the spot we needed to be in. I ran to the front gesturing and yelling at them to get out of the way, pointing up at how close our mast was to the raised bridge. They made some gesture which seemed to communicate, “You have plenty of room.” Idiots!! We squeaked through, lucky not to have hit our mast which would have been a disaster. This was no doubt a group that lived nearby and traversed the ICW frequently. Yet, the were clueless not just boating etiquette but vital safety rules. 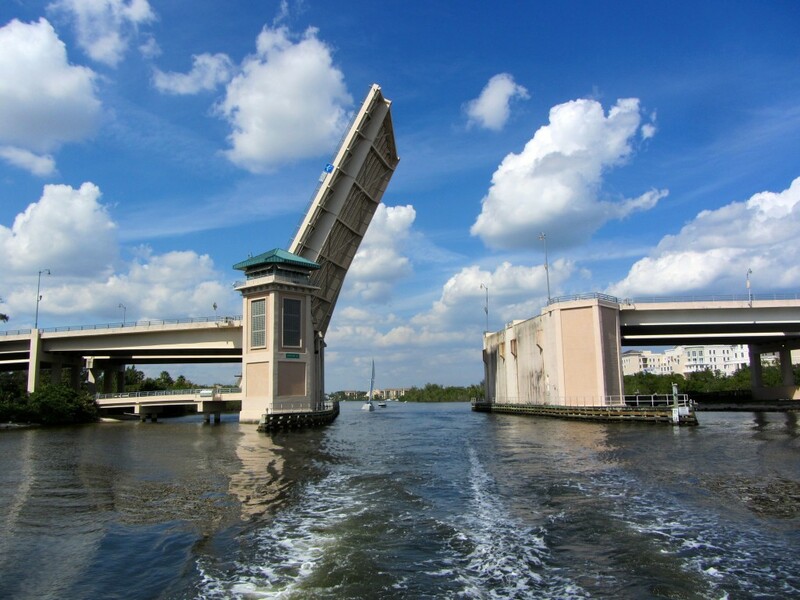 The photo below is a bascule bridge we had gone under with no problems, a smaller sailboat coming after us. You can see how a boat with a tall mast has to move to the open side to avoid the bridge. We arrived at our anchorage in Lake Worth (Palm Beach) at 3:30 pm. We prefer to stop at the north anchorage where there is easy access to a dinghy dock next to Federal Highway with every store we could want, plus a Starbucks. However, it takes about 1/2 hour to get from that anchorage to the one we stayed at which is right at the mouth of the inlet to the ocean. After setting the anchor and getting settled in, we took the dinghy to Peanut Island. This is a small island in Lake Worth next to our anchorage that is a beautiful park. People snorkel there and you can walk on the beaches or wide trails. 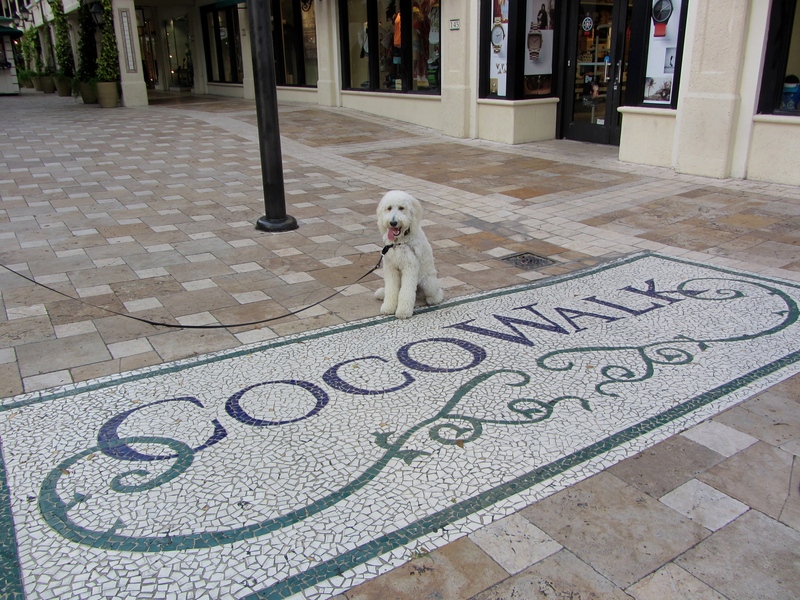 Sailor had a blast because there was no one near us and we were able to let him off leash. 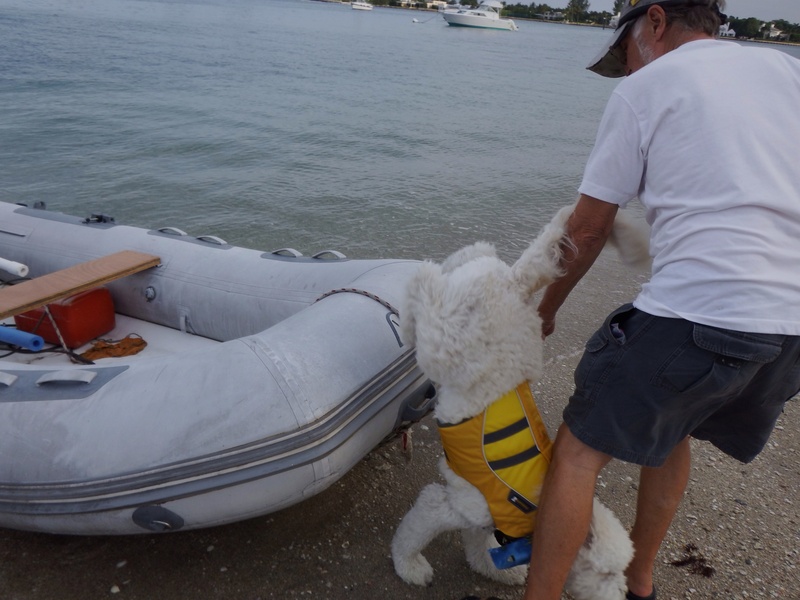 As soon as he got out of the dinghy, for his first time going ashore in a dinghy, he raced up and down the beach and…..straight into the very calm water. I’m sure he didn’t realize it was water, never having been in it at a beach. The shock on his face was priceless. I didn’t capture that, but did get a photo of him while he got back to shore as fast as he could. Below are a few photos from Peanut Island. Not too sure about getting into this dinghy. OK. Maybe this is kind of fun. Getting out isn’t so easy either. I think I’ll run on the beach. Hey! What’s this wet stuff? I better get out of here quick! 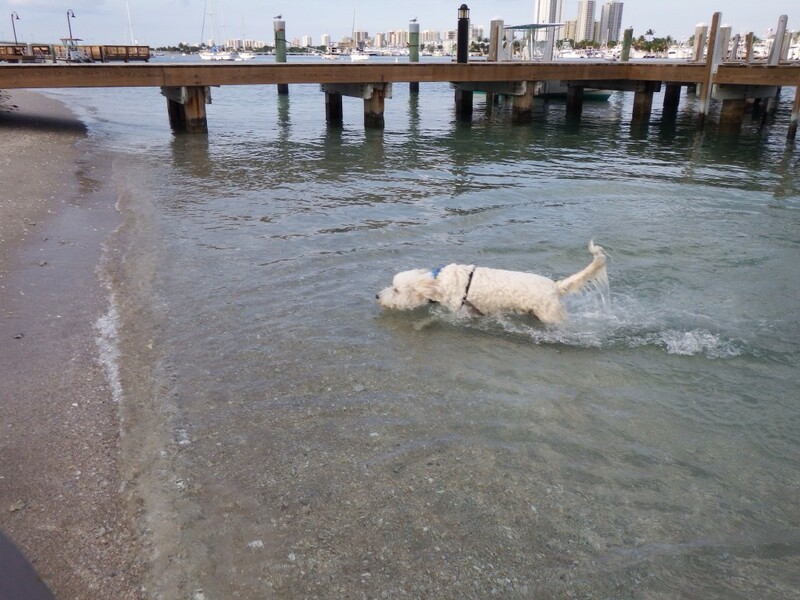 Peanut island in Lake Worth is a great place to walk, or for Sailor to experience his first swim. Next stop Ft. Lauderdale. Day One was fantastic! 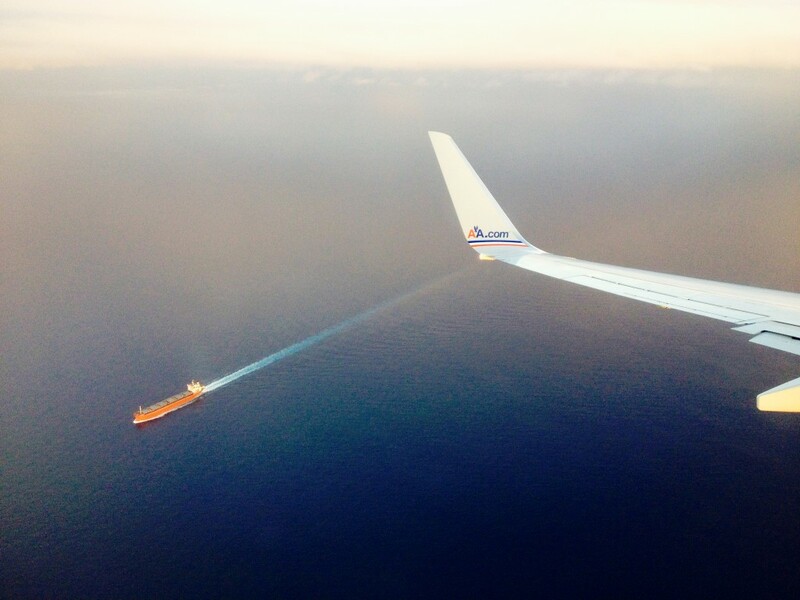 This entry was posted in 2013 - 2014 Bahamas Cruise, Sailing and tagged Lake Worth, Palm Beach on February 25, 2014 by Jan. Yesterday the riggers finished most of what they broke on the boat. After they left Mark had to fix some more of the electronics that weren’t working. Just when he thought all was well, he noticed the chart plotter screen getting dimmer and dimmer. We don’t know if it had anything to do with the other electronic problems caused when cables were cut, but regardless we realized we had to replace it. Unfortunately in the five years since we installed our Raymarine E120 chart plotter, the company has completely changed their chart plotters and they are now digital. 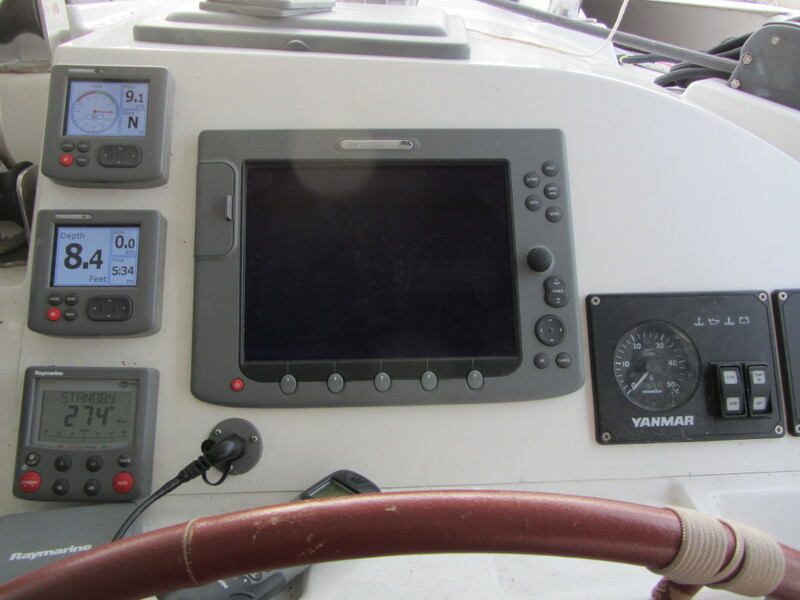 The only way to get the display fixed is to send it to Raymarine to be repaired, or we can buy a used one online. We did the latter and located one about an hour and 15 minutes south of us near Ft. Lauderdale. We purchased it and are driving down there to pick it up tomorrow morning. That is one advantage to being on the east coast of Florida. There were actually three displays on eBay located within an hour and a half drive of Stuart. All were probably removed when the owners replaced their units with the new digital model. If we could have left this morning, we would have been in Miami on Monday and could have sailed to the Bahamas on Tuesday when the current weather pattern is good for going across. Starting Wednesday, not so much. We subscribe to Chris Parker’s weather forecasts, Marine Weather Center. He sends out detailed marine conditions for the US East Coast, Bahamas, and Caribbean. He also does a daily weather webcast which is simultaneously broadcast on SSB radio. Here is part yesterday’s email forecast. Sat22-Tue25 should be OK for motoring BOTH Routes/Directions…but N Route may be mildest Sat22-Sun23, possibly Mon24 / S Route may be mildest Mon24 and possibly Tue25. Forecast confidence decreases Wed26 onward, with risk for inclement weather increasing dramatically late Wed26 or Thu27. Winter continues! S Branch of JetStream is active, and ColdFRONTs/possible LOs may form and/or track along GOMEX-FL-N Bahamas & waters N of Bahamas…and waters near or even S of Bermuda. March may bring a cycle which repeats every 7 days: 1-3 days of LO/FRONT/TROF with nasty weather (possible GALEs, at-least in squalls) along the axis detailed in previous sentence…forcing wind-less RIDGE S of 25N. 1-3 days of brisk N<E wind following FRONT in all of W Atlantic including ALL Bahamas & FL. 1-2 days of pre-Frontal clocking S<W wind ahead of next impulse mainly N of 25N / S of 25N moderate E<S wind. Then cycle repeats. Miami is at 25N. So we may be waiting for awhile in Miami, but that is not new. Unfortunately if we could have left earlier in February, there were multiple days of good crossing weather. Dolphins cannot help but bring a smile to your face and no matter how many times we encounter them, we have to stop and watch. Today they were playing in the marina by our boat tossing fish back and forth to each other. 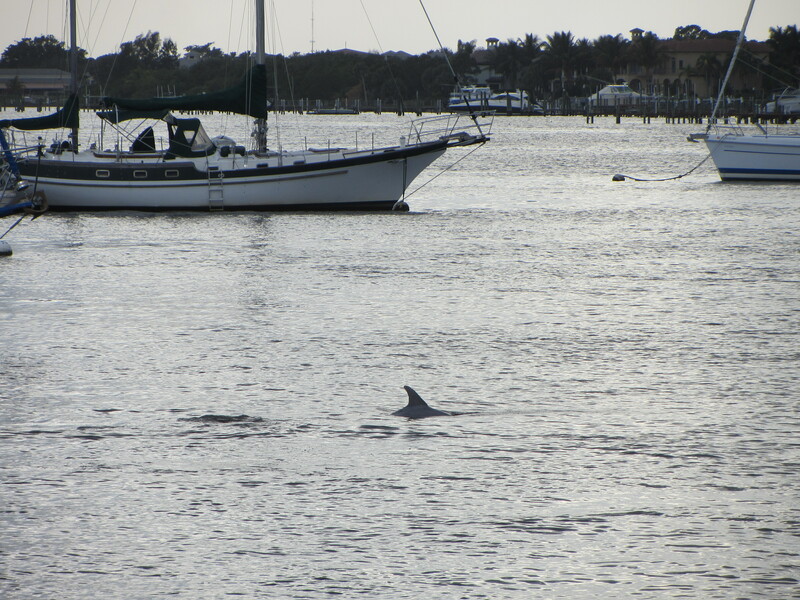 I didn’t get a shot of that, but I did get a picture of one dolphin diving. We needed a reason to smile. Sailor has learned a new trick. When a window in the salon is open, he likes to jump up on the couch, stick his head out and watch what is going on. He’ll have a lot to look at when we finally leave the dock. We’ll definitely need to keep him tethered and in a life jacket because he doesn’t get that he can fall in the water. 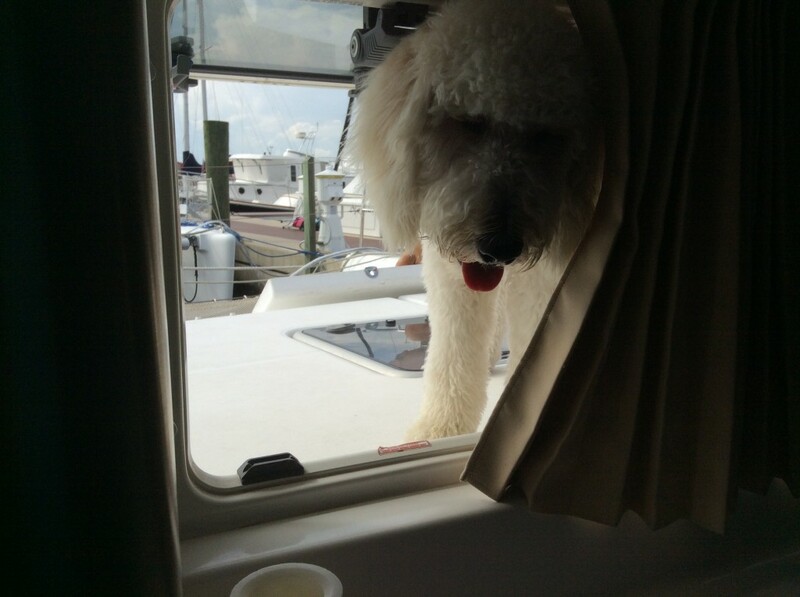 He does the same trick from outside standing on the foredeck and looking into the salon. 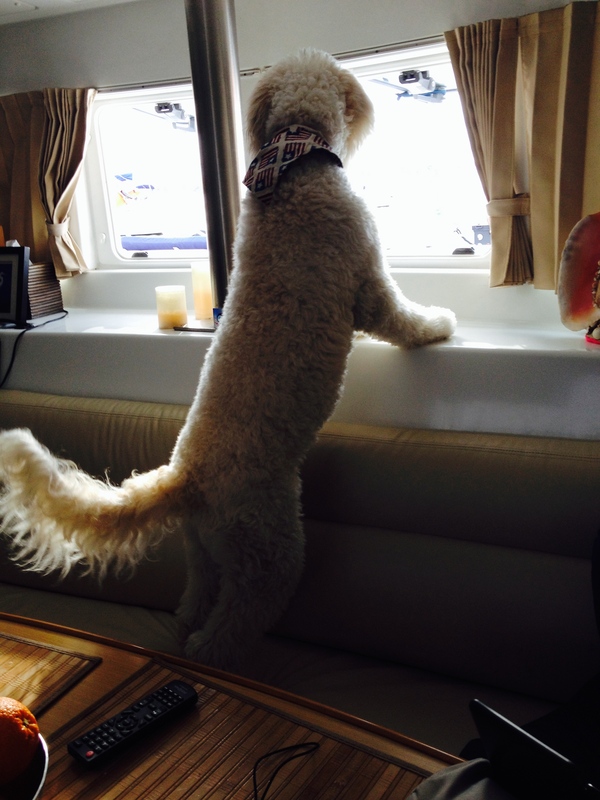 He hasn’t tried to leave or enter through that window……yet. This entry was posted in Boat Maintenance, Sailor Doodle, Technology and tagged Boat Repairs, Sailor on February 22, 2014 by Jan. Even I know that when something on a boat isn’t working, often the most obvious solution is the one to try first. Sadly, our riggers did not do that. It turns out there was NOTHING wrong with the radar unit. It was sent away to Raymarine and sent back with nothing done because it works, all of this holding up the repair by at least several weeks. When the mast was taken down, with the radar not disconnected, one of the riggers cut the cable to it. Mark saw it happen. And it turns out that is probably the reason the radar unit is not working. We are now waiting for them to find a new cable. They’ll be back tomorrow, or Friday. In the meantime, the anemometer is fixed. We have a new unit at the top of our mast. It’s nice to know the wind speed and direction again. So quite obviously we won’t get to Miami to cross by Sunday. Monday and Tuesday might still be possibilities. All of this is very disappointing. We have had our cruise delayed because someone didn’t think of the most obvious fix first. 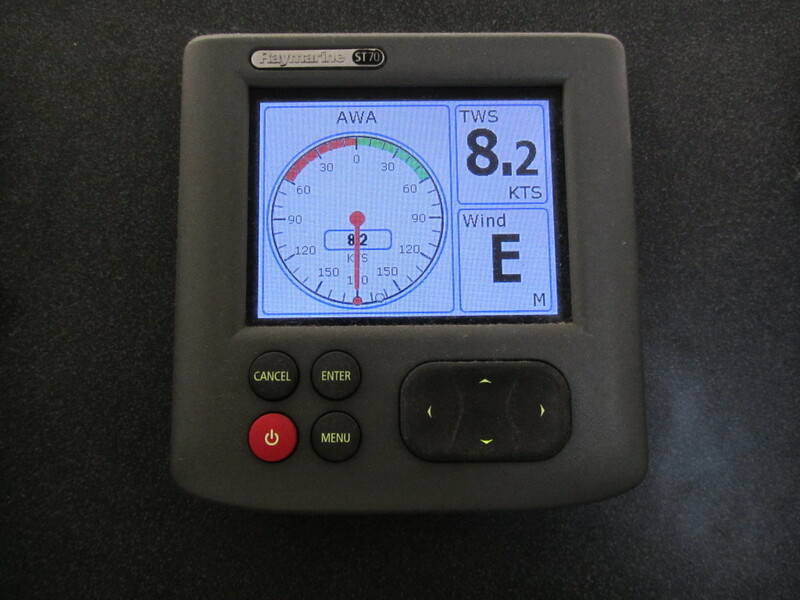 This entry was posted in Boat Maintenance and tagged Anemometer, Radar on February 19, 2014 by Jan. When you own a boat, you get used to making repairs, waiting for parts and changing your sailing plans. You also get tired of hearing the saying “It’s a boat,” meaning don’t expect to be treated by marine businesses like you are by a car dealer or any other company. We heard that within days of taking possession of Seas the Day in July, 2008. When we itemized a long “fix list” for warranty items, we didn’t understand why the company that sold us the boat wasn’t getting things done quickly. After three months we left Ft. Lauderdale with items not fixed. “It’s a boat” they told us. Slowly but surely we realized that everything costs more if it has the word “marine” in its description. We understood we needed to lower our expectations when dealing with these businesses or be forever frustrated. When something stops working on the boat, which happens regularly, we know we’ll have to fix it and it might affect our cruising plans. That occurred last year when we had a leak in a fuel tank days before we were leaving Stuart to start our 2012-2013 Bahamas cruise. We got the fuel tank fixed and left a few days later than planned. When we reached West Palm Beach, our first stop going south, we dropped the anchor into sand and the windlass dropped into the anchor locker. Ordering and installing the new windlass took a week, again delaying our cruise. 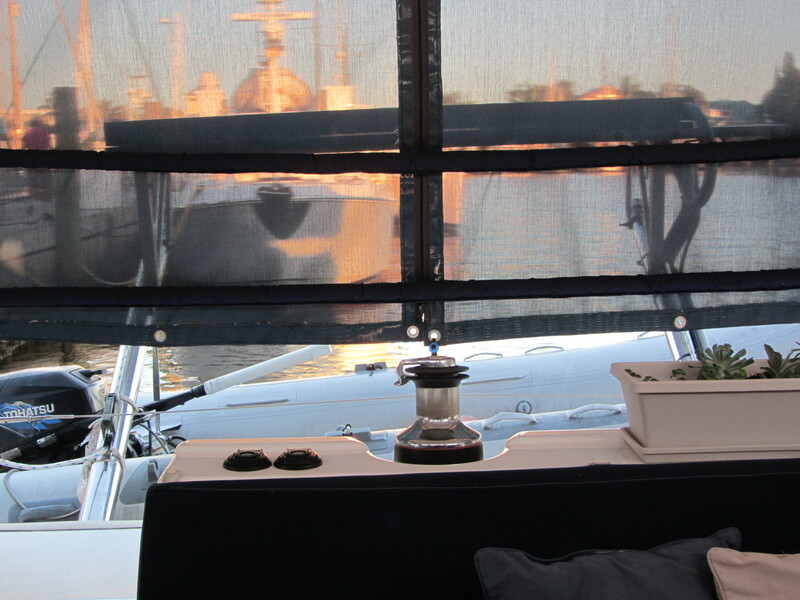 But it was OK…..unavoidable when you own a boat and we accepted it. However, when workers damage something on your boat and then don’t bend over backwards to fix it quickly, that is not acceptable. 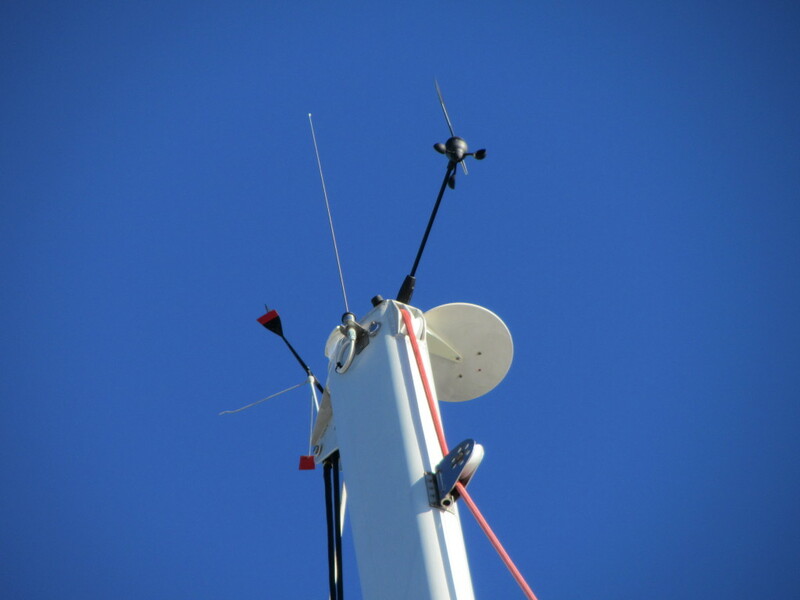 In June our anemometer was damaged when the mast was being taken down (unstepped). We saw it happen. We’re not sure when the radar was damaged: when the mast was dropped, when the mast was transported to or from storage, or when it was put back on (stepped). But we knew on our way back to the marina with the mast back on in mid-November that it wasn’t working. Today, three months after the mast was stepped, we finally got our repaired radar unit back on the mast. It’s not completely fixed but we have been assured that they’ll be back tomorrow to finish the job, along with installing a new anemometer at the top of the mast. If, and this is a big if, the repairs are successfully completed tomorrow (Wednesday), we can leave on Thursday or Friday. Sunday looks like a good day to cross from Miami to Bimini, and it takes us three days to get from Stuart to Miami if we don’t sail overnight. I have my doubts that we’ll make it there by Sunday, but if we can just leave Stuart this week with all systems working, we’ll be happy. 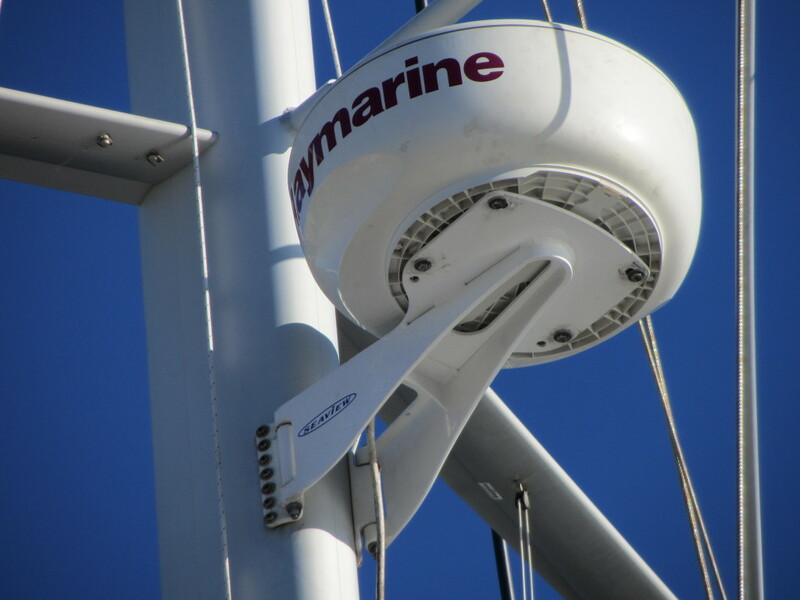 This entry was posted in Boat Maintenance and tagged Anemometer, Radar on February 18, 2014 by Jan.
One of the many things on our “to do” list was to replace the lifeline covers we put on to protect our sunshades from rubbing against the wire lifelines. 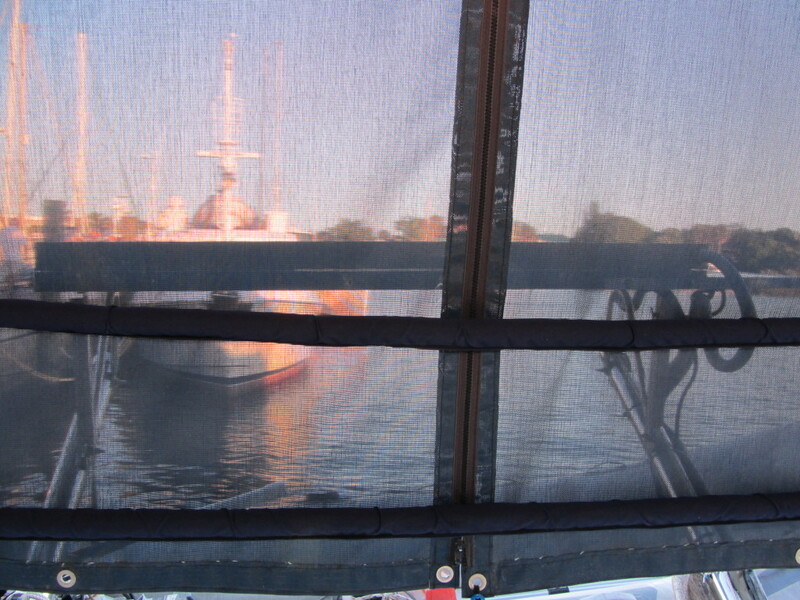 We had to do something immediately when we had the sunshades made several years ago and they were rubbing against the lifelines. The quickest, cheapest solution was to use swimming noodles. Not pretty, but they worked. After having G G Sails and Canvas in Stuart make us a new dodger last summer, we went back to them with this small project. We gave them the measurements and they sewed navy sunbrella covers which wrap around the foam and connect with velcro. Mark found much smaller pieces of foam to use. He first covered the lifeline with strips of 1/2 inch PVC pipe. Then he put the new foam over them. Finally, he wrapped the foam with the sunbrella strips. They are no longer an eyesore and will protect our sunshades. We could have purchased pre-made lifeline foam covers but they were very expensive and wouldn’t have matched this well. I guess the only downside is that we should have a sewing machine on the boat. I could very easily have made these sunbrella covers. This entry was posted in Outfitting additions and tagged LIfeline Covers on February 17, 2014 by Jan. The Lagoon 420’s came equipped with halogen overhead lights in the cabin and cockpit……lots of them. Last year we began switching them over to brighter, energy efficient LED lights. We finished the replacements this month. There were 12 alone in the salon/galley, and a total of 40 to replace. While considering what to put in the cockpit sitting area, where Mark recently built a large drop-leaf table, we wanted something that would provide plenty of light for card games, Mexican Train, reading, relaxing, and of course eating. There are only two lights on the hard bimini ceiling which is 9.7 feet above the cockpit floor. Even putting the brightest LED’s there wouldn’t give us the amount of light we wanted, so Mark built a hanging lamp fixture. We brought home a number of possible “shades” and ended up using a rattan basket. Inside it, Mark mounted an LED dome light with 36 warm white LEDs. We also experimented with various colors and sizes of chains and decided to use a white one. Then we had to decide how high above the table it should hang, which we determined by sitting at the table and raising the fixture until it was above our heads. After all those decisions were made, Mark ran the wires and made the adjustments. 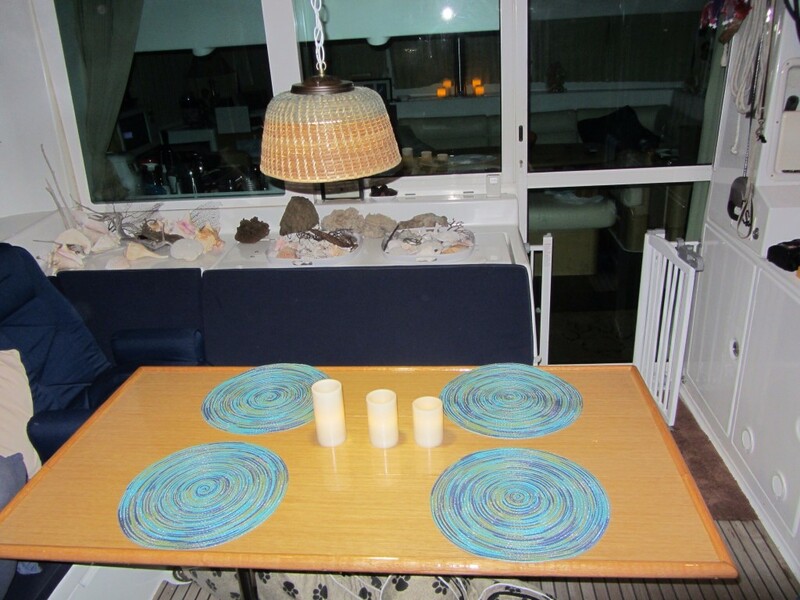 Now we have plenty of light shining on the table and our choice of blue or white LED’s high on the bimini ceiling. (Red is the preferred color for nighttime sailing because it doesn’t ruin your night vision, but we don’t like the look of red lights in the sitting area and don’t use those lights while sailing in the dark anyway.) We also have several lighting combination choices. We can have the two bimini lights on by themselves in either the blue or white color. Or, we can just have the hanging light turned on. If we want a lot of light we can use the overhead and hanging lights, all combinations made with switches. Only one problem remains. A hanging lamp on a boat obviously swings whenever the boat rocks. 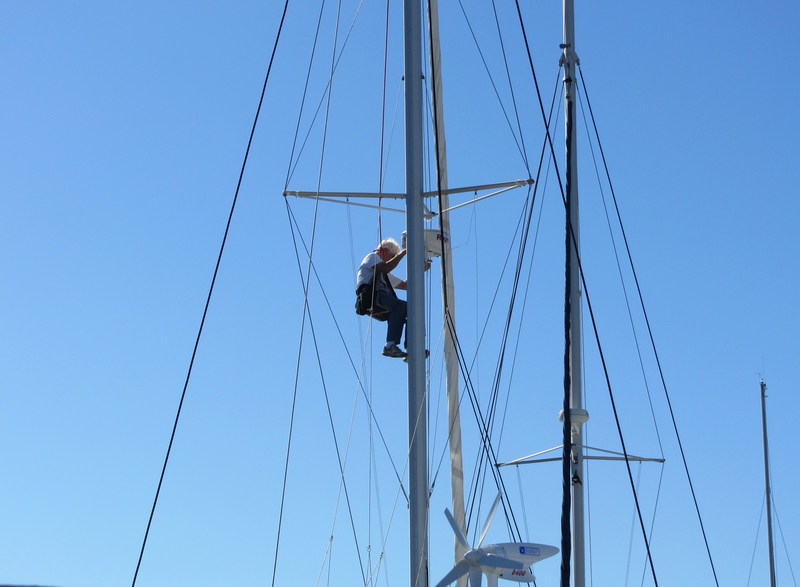 We have a way of tying off the hanging lamp in heavy weather or when sailing, but probably will get used to the swaying while anchored or moored in relatively calm water. Visitors on the boat might get hypnotized if they stare at it for too long, however, because it does tend to swing back and forth and back and forth. 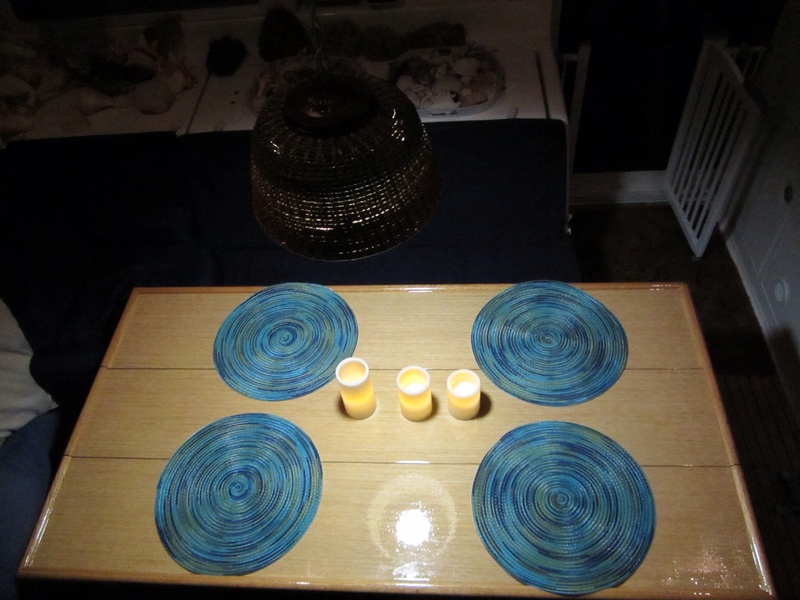 This entry was posted in Outfitting additions and tagged Hanging Lamp on February 17, 2014 by Jan. I spent the last three weeks in Maryland and California and flew back to Florida four days ago assuming we would be able to leave for the Bahamas in a day or two. 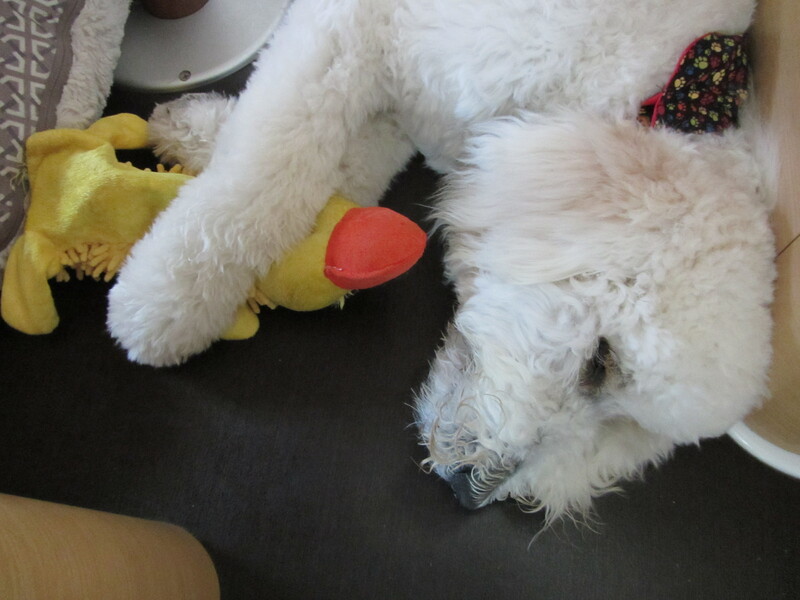 I had done all of my preparations before I left to be with Peter for his surgery and recovery. Mark worked hard while I was gone and finished almost all of his projects. However, two major problems are now holding up our departure. First, on the way to the airport on January 15, we were rear-ended in rush hour traffic on I95, one exit before the West Palm Beach Airport. It took several weeks to get the car owner’s insurance company to start the repairs on our car. We should get it back early this week. Second, we are waiting for repairs to be made to our radar and anemometer, both of which were damaged when the mast was taken down. We have been waiting since the mast was put back on in November to get the repairs done, and now we are getting angry. Hopefully we’ll get these parts repaired in a few days and be on our way by the end of the week. The time I got to spend with my son Peter was wonderful. The surgery successfully removed a tumor at the bottom of his spine and then we flew to California for two weeks. Peter was my tour guide every day as we visited beach towns, tourist destinations like Hearst Castle and Sequoia National Park, a Monarch Butterfly Park, wine tastings, Farmers’ Markets, and many walks on the dunes and various beaches. Rather than put entries about the visit on this blog, I posted pictures on my Facebook page, the link for which is on the top right hand side of this website and also here. Flying into West Palm Beach last week, I caught this view outside the window as I was watching the sunrise above the clouds. It reminded me that in a short time we would be passing large container ships like this on the ocean as we cross from Miami to Bimini. Today, Mark dived under the boat to clean the props. The St. Lucie River is so filthy from runoff in Lake Okeechobee that he couldn’t see more than five or six inches in front of him. He’ll finish cleaning the bottom when we get into cleaner water. 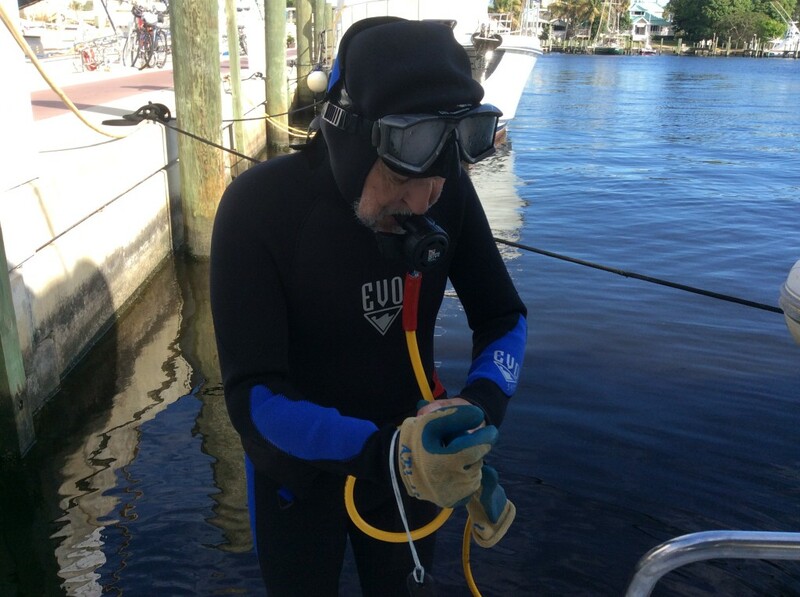 Mark uses a Brownie’s Yacht Diver Electric System to allow him to breathe air while cleaning the boat bottom or for any other reason we might need to dive under the boat. One of our recent unplanned purchases (there have been many) was a new XM Radio for the boat. We have always had an XM radio with a small speaker unit on the boat but it stopped working this fall so we bought a new one. We have speakers in the salon and outside in the cockpit, but had never tried to connect the XM radio to it. We did that today and now can use the indoor and/or outdoor speakers in the cockpit to play XM stations. Right now we are listening to a pleasant “spa” station which shouldn’t annoy our dock neighbors. I was afraid that Sailor might not remember me when I got back. At first he seemed confused but happily took the new toy I brought him. 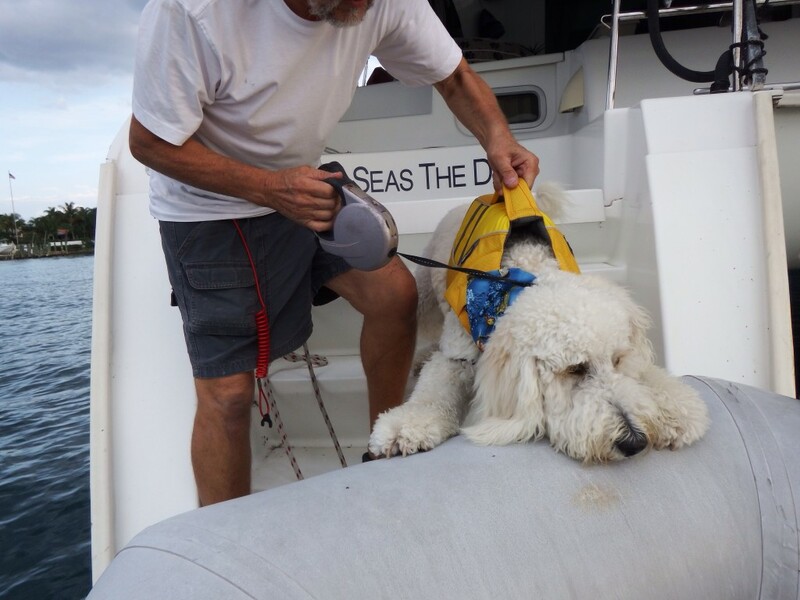 Hopefully we will get to leave Sunset Bay Marina this week to begin our next cruise to the Bahamas and Sailor can become a real boat dog. 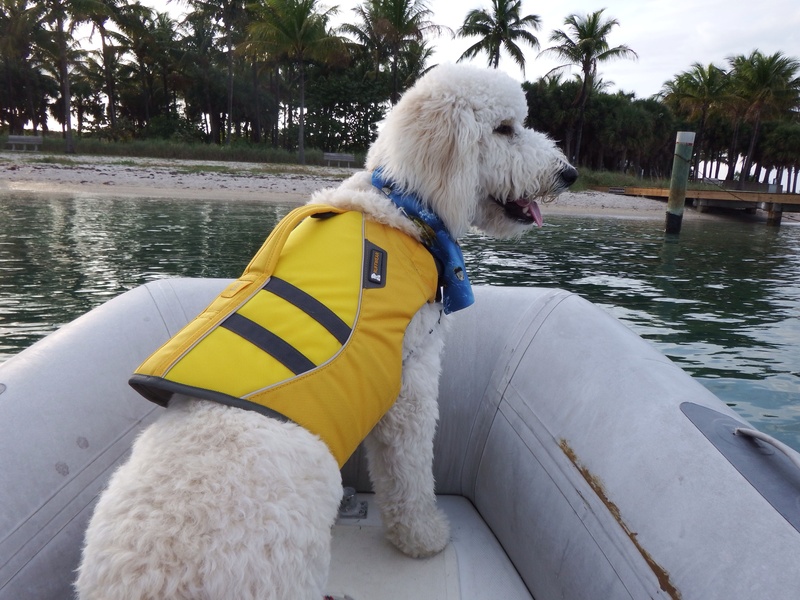 This entry was posted in Boat Dog, Boat Maintenance, Florida, Outfitting additions, Sailor Doodle, Stuart, Sunset Bay Marina on February 9, 2014 by Jan.